Smucker's has a reputation for putting out some very fine products. Their jams and jellies are top quality and have a legion of fans. So it was only natural that they ventured out with some new selections. First came their "Uncrustables". These are pre-made peanut butter and jelly sandwiches (with the crusts cut off, as the name implies) that kids absolutely love. Now they have come out with "Snack'n Waffles", individually wrapped Belgian-type whole grain waffles that have syrup baked right in. They heat in the microwave for 15 seconds ( which wasn't enough ) or you can pop them in your toaster. Because they are already sweetened and wrapped, after heating, off you go. 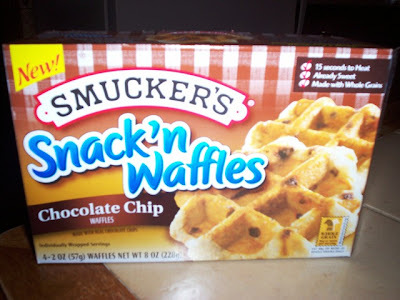 They were on sale at Stop & Shop at two for $4 (four waffles per pack). They come in four flavors: blueberry, maple, cinnamon, and chocolate chip (I bought the latter). My first reaction, I admit, was, "Why do we need this product?" 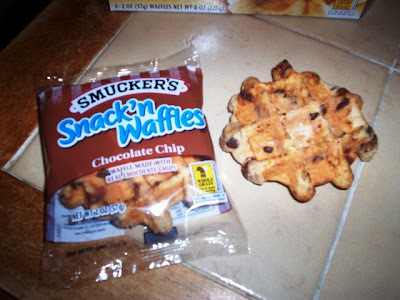 Frozen waffles are easy enough to eat and go. My niece puts cream cheese on one and heads out the door. My youngest daughter puts peanut butter between two waffles and takes it to work for her breakfast. But the more I thought about it the more I realized just how convenient this little waffle could be. No looking for sandwich bags. No buttering and syruping (syruping?). Just heat and go. But most important was the taste. How did they taste? THE VERDICT: Hmm .... They are thick like a Belgian waffle with a nice irregular edge, but they don't "taste" like a waffle. They have more of a bread dough-like texture and a sweet but bland flavor. I definitely prefer a regular thinner waffle. Plus, at 220 calories each with 15 grams of sugar and 70 calories from fat, one waffle would have to suffice for your breakfast and may have too many calories for your snack. A little disappointing, I don't think I'll be buying them again. But as I always say, try them yourself. 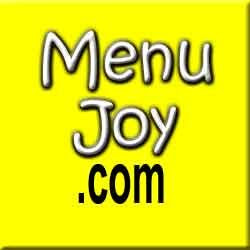 Don't forget to check out MenuJoy.com for area restaurant menus!